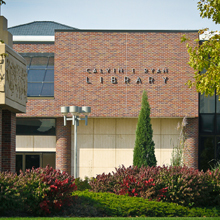 The University of Nebraska Kearney (UNK) Calvin T. Ryan Library supports the research needs of approximately 7,000 students and 400 faculty members. When Jon Ritterbush began his position as E-Resources and Serials Librarian in 2009, he realized the library needed an automated system for tracking the usage of its online serials subscriptions. With a staff of only two, including himself, Ritterbush needed a tool that would help him isolate high cost-per-use resources quickly, thereby allowing him to make collection development decisions that would both save the library money and better support users in achieving their research objectives. In late 2012, the library began subscribing to EBSCO Usage Consolidation, an affordable, easy-to-use tool that enables libraries to collect, consolidate, and report on usage data for their online resources, regardless of vendor. In addition, the library purchased EBSCO’s Usage Loading Service which obtains usage reports and loads them to the library’s EBSCO Usage Consolidation account. Since subscribing to these services, the UNK Library has been able to save time and better allocate its resources. The library at the University of Nebraska Kearney has been a long-time EBSCO customer, purchasing a majority of its serials subscriptions through EBSCONET. However, until last year, the library did not have a usage analysis system in place. Instead, E-Resources and Serials Librarian Jon Ritterbush would copy and paste DB1 COUNTER statistics into an Excel spreadsheet once a year, if time allowed. So Ritterbush advocated for the purchase of a system that would automate the library’s usage data collection process. He wanted a product that would allow him to see cost-per-use data for individual journal titles, scale usage reports to any time period, and free him up to focus on expanding the library’s research collection. EBSCO Usage Consolidation and EBSCO’s Usage Loading Service offered the UNK Library an affordable solution. In late 2012, the UNK Library began subscribing to EBSCO Usage Consolidation. According to Ritterbush, three main factors led the library to purchase the tool. First, EBSCO offered the services he was looking for in an affordable package. Second, EBSCO offers the option of purchasing its flexible Usage Loading Service, a specialized team that obtains usage reports, loads them to the library’s EBSCO Usage Consolidation account, and matches title exceptions. Ritterbush liked how he could choose which platforms to have loaded by EBSCO and how often. Finally, through a combination of EBSCO Usage Consolidation and the accompanying EBSCONET Analytics, Ritterbush can take advantage of real-time insights into critical usage data, including cost-per-use, in an easy-to-read dashboard that enables rapid analysis of e-journals and e-packages. Since implementing EBSCO Usage Consolidation, the library has been able to reduce costs. Over the summer, Ritterbush discovered that the institution was subscribing to a biology journal through EBSCO that cost $5,000 annually but had only been used once in the past year. The discovery prompted Ritterbush to consult the biology faculty, who agreed to discontinue the subscription when they learned that Inter-Library Loan could fulfill requests for articles in seldom-used journals at a much lower price. Ritterbush said he plans to share usage information with all faculty members, as they can provide additional insight regarding high cost-per-use titles. Going forward, he hopes to purchase more serials, eBooks, or a new EBSCO database. So far, at the request of faculty members, the library has added to its 2014 subscription four periodical titles in education and library science.